"A C.D. 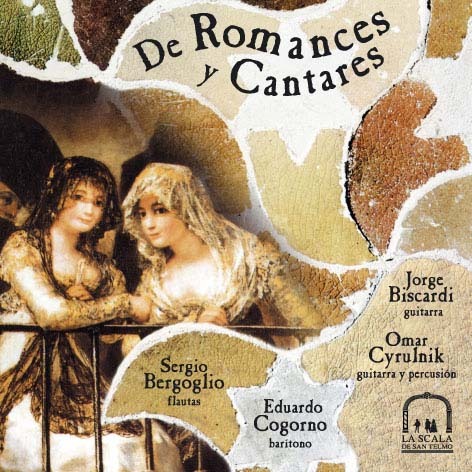 by Eduardo Cogorno and friends: "De Romances y Cantares" ( La Scala de San Telmo)"
of love for Spanish music emerges from the voice and the instruments as strong, pure and charming now as it did then." "De romances y cantares: Spanish music of all times". brings back the essence of Spanish music and invites us to visit peeninsular sounds, materialized in a disc with songs of all times." y Cantares, created in 1984 with the objective of spreading Spanish music form the Renaissance to the present time. The instrument players also have a chance to show their skills as soloists ." 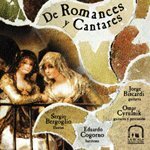 "De Romances y Cantares” a new disc with Spain in their heart"
there are some who want to follow on those tracks, renedring words and melodies that make up six centuries of perfect harmony. if stadiums are filled by Las Piedras Rodantes and Co.? Anyway… as they say in Flemish, ¡don't let the party stop! Baritone Eduardo Cogorno's carreer has been long and fruitful, not only as a performer but also as a teacher, stage director and specially, as the alma pater of La Scala de San Telmo (Susana Santillán being the alma mater), one of the brave cultural havens that stubbornly trudges ahead with no official support. All sorts of good music (classic and popular) are performed there, such as ancient Spanish melodies. And the group De Romances y Cantares are one of this repertoire's staunchest champions. It was founded in 1984 by Cogorno, Jorge Biscardi (guitar), Omar Cyrulnik (guitar and percussion) and Sergio Bergoglio (assorted reeds). They finally made there first disc, wich was long overdue. The lions' share goes to Cogorno's melow, velvety baritone, but this companions also have chances to shine individually. This is quite a pleasurable, charming achievement that includes songs and pieces that date from the 16th century onwards, by the ubiquitous Anonymus (in several guises), de Falla, Rodrigo, García Lorca and our own María Elena Walsh, who, in her youth along with Leda Valladares, was a busy compilator of ancient musical lore, both here and in Spain.